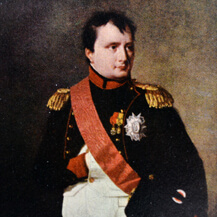 Napoleon Bonaparte (1769-1821) is known as both one of history’s most ruthless tyrants and one of its greatest military geniuses. Rising from meager beginnings, Bonaparte twice became absolute ruler of France. He pushed to expand his empire across Europe, bringing him into conflict with the other great powers. He very nearly subdued them and might have had he not blundered in an all-or-nothing campaign in Russia. Ultimately, the Russian winter decimated his armies and brought an end to his first rule. Despite his negatives, it’s hard to argue with his amazing success. He fashioned himself a kind of philosopher. Following are 11 famous quotes from the French Emperor Napoleon. I feel myself driven towards an end that I do not know. As soon as I have reached it, as soon as I shall become unnecessary, an atom will suffice to shatter me. Until then, all the forces of mankind can do nothing to stop me.